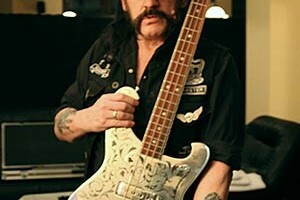 Apparently, Lemmy Kilmister has one of the coolest bass collections on the planet. One of our very first Bass of the Week features was of the Motorhead frontman’s signature Rickenbacker. 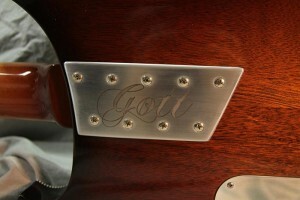 This week, we’re checking out his Nick Page Gott 4, which the luthier built specially for him. 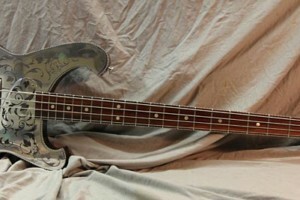 Page built the bass with a two-piece Honduran mahogany body and special T6 aluminum top with etched graphics. The body’s binding and dots are all original celluloid. 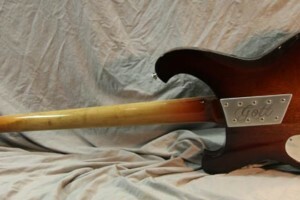 The neck is American Maple with a Macassar Ebony fingerboard. 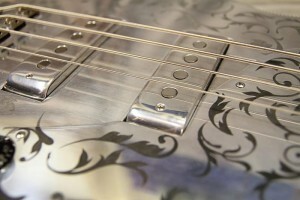 For pickups, the bass has a pair of custom single-coils with controls configured Volume/Volume/Tone. Lemmy’s model also has a pickup selector toggle switch. 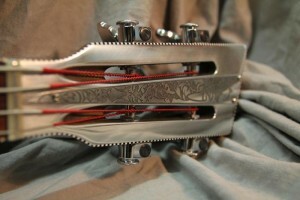 Other hardware includes an ETS bridge with a custom Aluminum stoptail and special modified Sperzel tuners. Lemmy’s Gott 4 is a one-of-a-kind piece, though Page is now open to making more Gott 4’s with different body woods and finishes. As each piece is custom, prices vary. 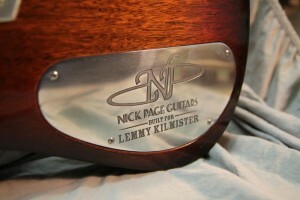 For more, check out the Nick Page Guitars website. Binding and Dots all original celluloid. hey do you play up the line, do you have a schedule, maybe one night my friends and I will come see the band. Always looking for good music. Do you think he ever plays it? I just hope the maker wasn’t wasting his time just for a photograph. 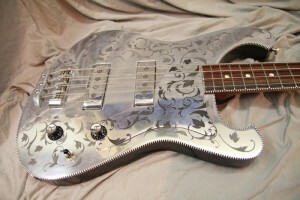 It’s one of the most beautiful basses I’ve ever seen…I wonder how it sounds. I would love to have a Jazz 5 made in that same style, I like it. How dose it sound?